Over the past few years I have certainly evolved on my longarm quilting journey. 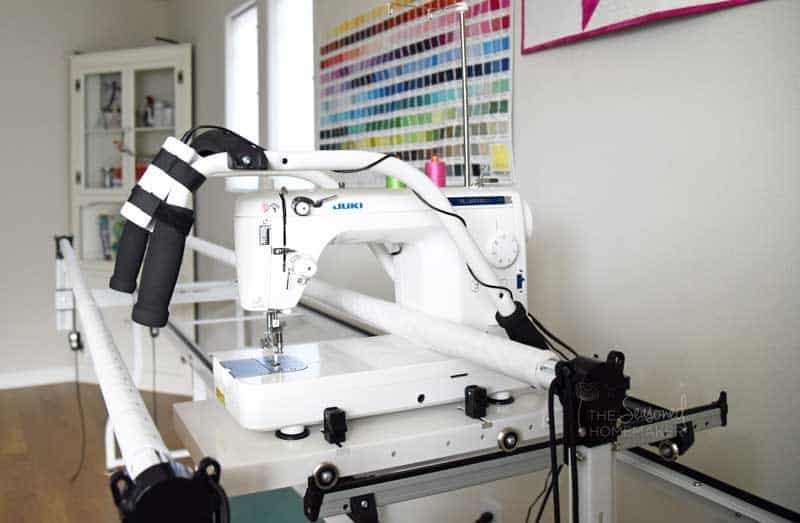 When I first started exploring the idea of purchasing a longarm I started with a simple frame and a domestic machine. This was an affordable way to test the waters and see if I even liked quilting on a frame instead of a sit-down machine. Since I already owned the sewing machine, my only cost was the frame which I purchased for a good price. I quickly discovered that I loved finishing quilts this way. I was able to quickly do some simple designs and my quilts were finished in a snap. But, there were some limitations with this system such as throat space and my undeveloped skills. So, I began looking at an upgrade. It didn’t take me long to realize I wanted a larger machine with more throat space and possibly a larger frame. But finding basic information about longarms that could help me make the best decision was a serious challenge. Let me tell you, I did my homework. But the long list of available options that must be weighed can be overwhelming, especially if you are unfamiliar with longarms in general. To help with this, I set up a Google spreadsheet where I would drop in information as I came across it. Note: If you decide to set up your own spreadsheet I recommend adding a Computerization column and a Computerization Cost column. After carefully sifting though information for a year, I decided the Grace Q’nique 14+* with a Continuum frame* was the best option for me. (*affiliate) This was the most affordable set up with some of my must-haves. I’ve been extremely happy with my machine which is why I decided to go one step further. Look for a Confirmation email in your inbox. When you click Confirm, the printable should immediately download. 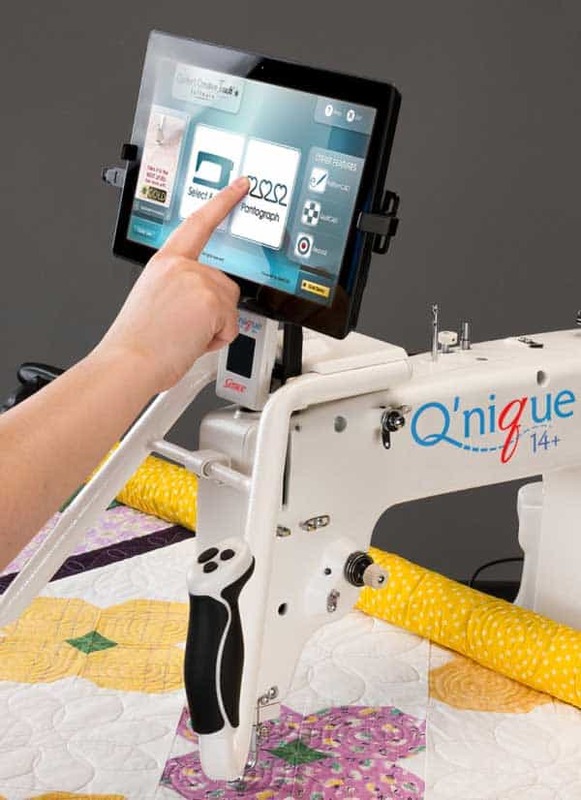 After finishing a lot of quilts on my Q’nique I decided to look into longarm automation. This is basically a computer program connecting a longarm machine and frame. Choose a design and the machine quilts it for you. 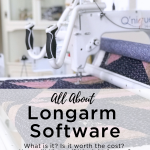 While it sounds pretty basic, there are a lot of things to consider before diving in and purchasing longarm automation. Longarm computer programs are tied directly to the longarm manufacturer. For instance I have Quilter’s Creative Touch 4 (QCT4) (affiliate) from The Grace Company. I purchased my computerized automation software separately a year after buying my machine. When looking at machines, also consider the manufacturers cost for computerized software in case you want to add it in later (like I did). 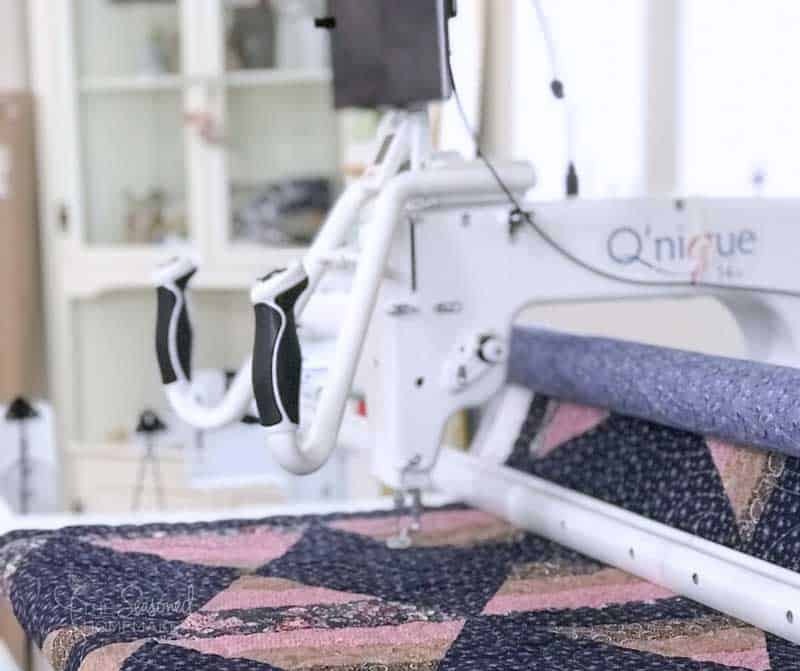 Some manufacturers charge in the $10K range for their software which includes more quilting designs and built-in features because it’s designed for professional longarmers. Others, (like The Grace Company) have more reasonably priced entry-level software that can be upgraded as needed, but you must supply your own tablet. Some software is very similar. For instance QCT4 by The Grace Company looks almost identical to Quilt Path by APQS. This is great for QCT4 users because APQS has a lot of Youtube videos on their software. Most of the software is user-friendly, but there is a learning curve. Unless you’re a super computer whiz you will have to learn how to use the software and that means making a few practice quilts. You can purchase reasonably priced longarm digital designs online and upload them to your software! I’ve found some great designs at Urban Elementz and My Creative Stitches. The longarm software will likely come with a digital manual. I’ve not found mine to be particularly helpful and have relied, instead, on Youtube videos. There are Facebook Groups tied to the different software programs. These are great for asking questions, sharing videos, and finding the latest information. If you’re thinking about getting automation software, I recommend joining a group before purchasing. Almost all manufacturers have sales around the time of the Houston Quilt Market and Houston Quilt Festival (Late Oct./Early Nov.). If you’re not in a hurry, it’s the best time to buy. Some manufacturers have a demo version of their software that you can download and try before you buy. Subscribe to all of the manufacturers you’re interested in learning more about. You will hear about sales and can watch their weekly videos. This can be really helpful in making a decision. 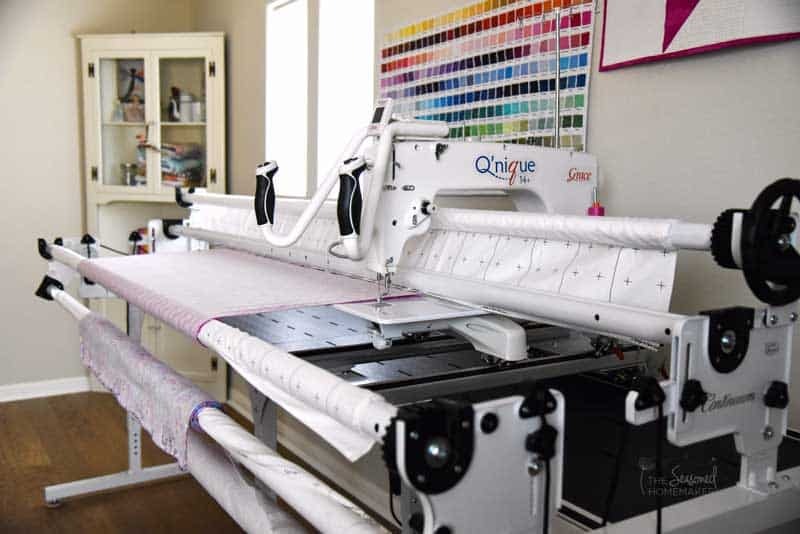 Using a computerized longarm is a great way to start a longarm business. Once you’ve mastered the machine and software, you can start quilting for others. 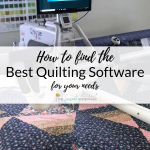 This is a great way to pay for your machine and software because there is no shortage of people who want someone to do the quilting for them. 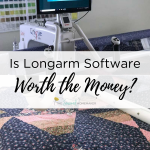 To learn more about setting up a longarm quilting business I recommend checking out Longarm University. 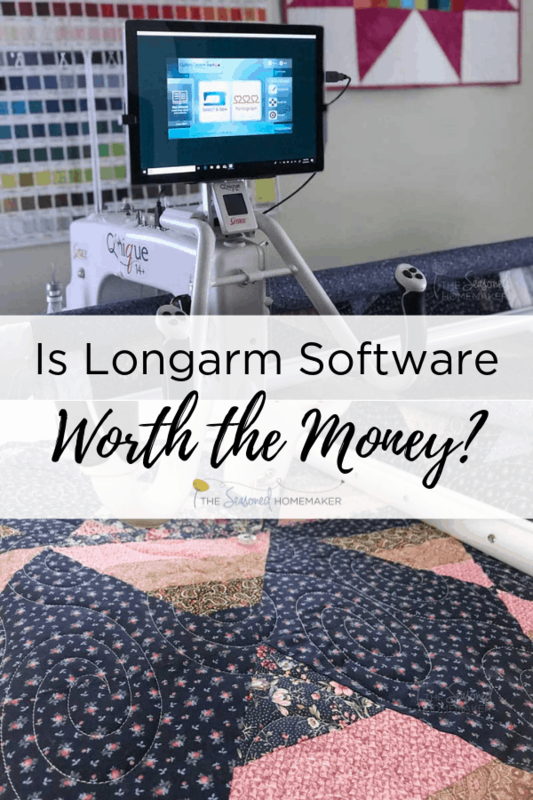 When is the Right Time to Purchase a Longarm Computer? This is a question only you can answer, but I am happy to share my story. As I said above, I came to longarm quilting slowly taking small steps along the way. This allowed me to get comfortable with the quilting process and evaluate if I was willing to spend more money. Once I purchased my own longarm machine, I then spent time practicing and quilting my own projects. It was during this time I began researching longarm automation for my particular machine. I wasn’t sure if I would even want to spend the money or learn the software. In order to learn more, I joined a Facebook for a group to see what others had to say about the software. Since I own a *Grace Q’nique 14+ I had I had to purchase their *QCT4 software. (*affiliate) The Grace Company has two software options: QCT4 Beginnings and QCT4 Standard. I debated getting the Standard, but eventually decided on the Beginnings because I can upgrade anytime in the future. Plus some of the other features on the Standard edition (like Gold Card Access) really work better with larger machines. Choosing the Grace Q’nique allowed me to scale up as my skills and knowledge grew. Doing it this way, I didn’t have to drop a large sum of money all at once. Instead, I’ve been able progress at my own pace and master skills before expanding. This made purchasing beginning automation just another step along the way. If you’re curious about computerized longarm quilting, then I recommend doing your homework. Visit the different manufacturers when you’re at a quilt show, and ask lots of questions, and put them on a spread sheet. (Ex. I called one of the manufacturers and asked them to explain Channel Locks to me.) Then you’ll know if buying a longarm with a computer are the right thing for you. Full disclosure: I am an ambassador for The Grace Company but do not receive any compensation or products from them with the exception of a monthly discount coupon. I’m a huge fan of their products and I adore their excellent customer service. Because of this I chose to be an ambassador as a way to share the company and their products with a larger audience. Thanks Leslie, I have a Q’unique 21” and go back & forth about automation. This was good information to help begin clarifying if I need automation or not. A really good read, Leslie, thanks. I started quilting in 2002, and after I made a special quilt, had it quilted by someone else. At that time I knew I wanted to be able to make my quilts from beginning to end. I had struggled with a few big quilts through the throat of my domestic, that wasn’t going to fly indefinitely!! Like you, I researched thoroughly and being from Canada I had a few challenges in terms of how to purchase and get service. I ended up flying down to a big quilt show and testing all of the models that were out there and I was interested in and bought there. Then I went to Houston Quilt Festival that same year and took a bunch of classes. Truly everyone is different in what they want to do with their machine. I wasn’t planning on starting a business but I probably do 1-3 quilts for friends in a month. I don’t think I will ever get automation, enjoy free hand in my basic way (not a big fan of ‘quilt to death’) and have started pantographs in the last couple of years to offer my friends more options. Thanks for putting this out there. I too have a Qnique 15R machine. I have been thinking of going automated.. You said you had to purchase a tablet. What tablet do you use, and how does it fit in the machine? Is there a holder gor the tablet? First, I recommend you join the software Facebook Group and second, download the demo software from Grace (must be on a PC, not a Mac) and third, watch a few beginner videos. APQS youtube videos are great for getting started. When you purchase the QCT4 software it comes with a tablet holder that adjusts to fit most tablets. There are recommendations on the website or you can call customer service and they can make a few recommendations (what I did). I bought a Microsoft Surface Pro 6 which I purchased during Black Friday at Costco – so I got a super deal. Excellent blog…lots of great info. It was almost like you were in my head. I am heading this morning to what I consider the best Quilt Show in the country…and I have been to enough to compare it too – The Mountain Quiltfeast in Sevierville, Tennessee. It happens every March. It is run by the two local quilt guilds and they certainly have their act together! Admission is even free – unheard of! I will be testing out the long-arms there. Between your blog, Leslie, and being able to test out several different models at one time, I should be able to make a decision. Thanks for the GREAT article. BTW, I have been leaning towards a Grace…your article may have just sealed the deal!